Taxes have been the bane of mankind since the dawn of civilization. Taxes can take many forms in a medieval milieu. Taxes that only apply to the citizens of a city-state are not covered here. Tolls: Tolls are charged on most rural roads by the communities tasked with maintaining said road. These tolls will usually amount to about a single silver piece if traversing the domain of a city-state. Entering a city-state’s walls will cost about 1 gp per foot or 2 gp per wheel. Thus a man riding a horse that is pulling a wagon would have to a toll of 12 gp. Tithes: The medieval church expected everyone to pay one tenth of their income to the church. For players who draw some or all of their power from the divine, this be more like 10 gp per level per month in sacrifices. For other adventurers, you might require they pay a tithe in order to enjoy the benefits of divine spells (i.e. pay up or no healing). Money Changing: This is not technically a tax, since it isn’t levied by the government. None-the-less, changing from one metal to another or from metal to gem will usually carry with it a 10% surcharge. A college is an association of priests under the leadership of a high priest or pontiff. The college, with the monarch’s blessing, appoints the heads of the city-state’s temples and enforces ecclesiastic law. These concepts may seem more appropriate to a monotheistic faith based on the medieval Christian church than to a fantasy polytheistic system, but they are based on the system used in pagan Rome that was later adopted by the early Christian church. The Roman college of priests had several responsibilities, including regulation of the divine spell casting, consecration of temples and sacred places, regulation of the calendar, administration of the law relating to burials and adoptions, superintendence of marriages and maintenance of historic archives and keeping a list of judges and recording the minutes of their courts. Rome had a greater college of 13 priests of local gods and a lesser college of 15 priests of foreign gods. Towns have one or two temples, each staffed by a priest and 20 to 30 clergy. Cities have from 8 to 12 temples representing the chief deities of the local pantheon. A metropolis has 30 to 40 temples dedicated to major and minor members of the local pantheon and popular deities of foreign pantheons. The largest temple in a city-state is dedicated to its patron deity. The city’s high priest (a cleric or druid of level 5 to 8 or a sage with the same spell casting ability) is a devotee of the city’s patron deity and a former adventurer elevated to his position by the city-state’s college of priests. Lawful and neutral temples sell holy water, but not potions. Most city-states also have one or more cults dedicated to demon princes, arch-devils or elder gods. A cult consists of a level 3 to 12 cleric, 1d4 level 1 clerics and several lay members (peasants, artisans, nobles, etc). Merchants are organized into chartered companies. They get the right to trade in return for their monarch getting a percentage of their earnings. Merchant companies have many investors that never leave the city-state, as well as merchant-adventurers who venture out on ship or caravan to actually trade (see traders above). Merchant companies consist of 2d6 merchant adventurers of level 3 to 12. Merchant companies provide their members with a strong box for the storage of valuables for free and to non-members for a fee. They maintain alms-houses, fund vocational schools and support churches dedicated to their patron deity. They are usually granted monopolies by the crown; this may be a monopoly on a particular trade or a particular geographic area. Many colonial companies mint their own coinage. They are usually required to fly their city-state’s flag, use only ships built in their city-state and pay a percentage on each shipment to the crown. Company rules might dictate that members may not belong to other companies, members must pay a fee to join (upwards of 10 gp) and members will not break the rules under which the company is chartered. Notable merchant companies include the Merchants of the Staple, Mystery and Company of Merchant Adventurers for the Discovery of Regions, Dominions, Islands and Places Unknown, Society of Merchant Venturers, Fellowship of English Merchants for the Discovery of New Trades and the Honorable East India Company. City-states organize their artisans into chartered guilds (also called mysteries or livery companies). Guilds are led by an elected guildmaster and a council of masters. Every profession has its own guild and guild house with an attached chapel dedicated to a deity associated with the guild’s profession. Guildhouses provide a strong box for the storage of valuables to guild members for free and to non-members for a fee. The chief spokesman of the guilds is the lord mayor of the city-state. The leading delegates of the guilds are the city-state’s aldermen. The other guild members are burghers. Guilds are ordered in prestige according to the time of their founding and occupy rotating seats on a guild council in this order. A town has a single guild house for all of its guilds, while cities have a single guild house for the smaller guilds and separate houses for the larger guilds. Guildsmen swear oaths to the guild and to the crown. Each guild has the right to display a coat-of-arms. Mercenary bands often camp outside a city-state’s walls while their captains look for employment. Assume a 1 in 6 chance during spring and summer and a 4 in 6 chance during autumn and winter. Mercenaries are willing to work for adventurers, but they will not enter a dungeon, lair or ruin until it has been cleared of monsters. A mercenary company is commanded by a captain (1 in 6 chance of being a level 5 to 8 fighting-man). The captain is assisted by a sergeant. The company consists of 1d4+1 units, each consisting of 12 men-at-arms under the command of a sergeant. The type of warrior in each unit can be rolled randomly. Mounted archers and crossbowmen ride normal horses and do not fight on horseback. Cavalry ride warhorses. 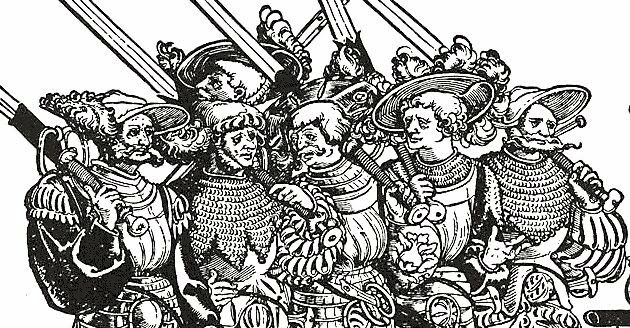 Historic mercenary band include the Dove Company, Ventura Companies, Company of St. George, Star’s Company, the White Company of John Hawkwood, the Little Hat Company and the Company of the Rose. A thieves’ den is led by a thief of level 9 to 12. This makes the master of the den one of the most powerful adventurers in the city-state, which goes a long way to explaining the corrupt nature of most cities. Assassins, bards and illusionists can be in spy rings of similar organization. The den consists of 2d6 level 1 thieves, 1d6 level 2 thieves, 1d3 level 3 thieves and 1d2 level 4 thieves. The den has a lieutenant of half its leader’s level. Towns have a single den of thieves. Cities may have several competing gangs. A university is a guild for sages. Universities need not occupy a physical space. Classes might be taught wherever there is room. Some universities rent space (like the modern University of Phoenix ) and eventually some are granted buildings by generous aristocrats. Universities are found only in big cities. Universities come in three types, depending on who pays tuition. In the first model the teachers are paid by the students, thus putting the students in control. These universities generally specialize in the study of law. In the second model, the teachers are paid by the local temple. Naturally, theology is the main course of study in such universities and teachers have complete control over their students. Students in theological universities are afforded legal protection by the clergy, in effect being considered junior clergy and thus immune to secular laws. In the third model, the teachers are paid by the state and given the protection of the crown. Students enter university at age fifteen. They live in rented rooms or houses provided by benefactors. These houses are organized on the basis of one’s nationality. It takes six years for students to complete their studies in the faculty of arts (arithmetic, geometry, astronomy, music theory, grammar, logic and rhetoric). Once a Bachelor of Arts has been obtained, students choose one of four faculties (law, medicine, theology, or science, i.e. lawyer, healer, priest or alchemist) in which to pursue their master’s degree and doctorate degree. Each degree takes six years to complete. Classes are taught around single books, not subjects. Classes are not elective – all students must complete the same classes. Classes begin at 5:00 AM. Students will make up approximately 1 percent of a city-state’s population. There is one sage for every ten students. The average town has one inn and six taverns. Cities have 5 inns and 25 taverns. A metropolis has 25 inns and as many as 125 taverns. For the Referee’s purposes only a few of these places need be described. Rate these places as being poor (1 gp per night), middling (5 gp per night) or good (10 gp per night). The quality of meals and number of services will depend on the quality of the inn. Most guests sleep in the common room downstairs. Individual rooms can be purchased at triple the normal price. These rooms rarely have locks on their doors and the cleanliness is always questionable. When designing taverns, do not limit yourself to the tried and true alehouse. A tavern might also be an upper class club, a coffee house frequented by wealthy merchants, a tea house or even an opium den.